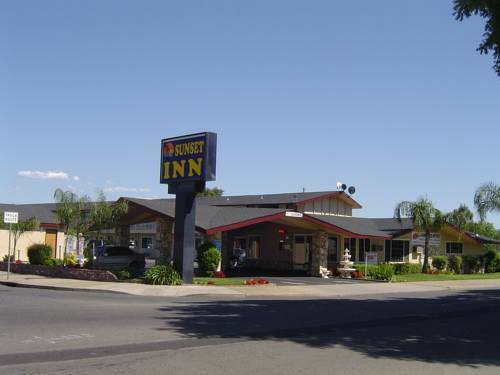 Welcome to our Sunset Inn-Lake Oroville.Whether you are traveling on business or pleasure we know you have a choice and we are honored that you selected our property for your lodging needs.We are committed to providing you with the high level of service you come to expect from the Sunset Inn name and pledge to do our Personnel Best to make your stay an enjoyable one.Our goal is to exceed your expectations by providing memorable service and clean comfortable accommodations. Sojourn Cafe and Bar: Sojourn Cafe and Bar 6.30am till 11.30pm A La Carte Breakfast lunch and Dinner plus light snacks. AIRP-SACRAMENTO INTL From Sacramento International Airport take North I-5 of I-5 take North 99 to Yuba City.Of Hwy 99 take Hwy 70 North to Marysville.Follow Hwy 70 to Oroville.Take Oro Dam exit make right at ramp and left at first traffic light and go about two blocks. CAL STATE UNIVERSITY OF CHICOCAL STATE UNIVERSITY OF CHICO ON 20 MINUTES FROM HOTEL. LAKE OROVILLE AND DAMLAKE OROVILLE AND NATIONS TALLEST DAM 770 FEET HIGH 6 miles EASTto the property 167 miles shoreline boatingfishing.